JZ Knight is the inventor and Dr. Matthew Martinez helped co-develop and run the initial patient trials in his office in Olympia WA. Blu Room Therapy consists of narrow band UVB Light, music, and the power of the mind which creates an atmosphere where thousands of users worldwide have reported healing benefits such as anxiety and pain relief as well providing help to heal auto-immune disease and cancer. What is a Blu Room session like? Ha! That is a loaded question. I invite you to come have your own session to find out. 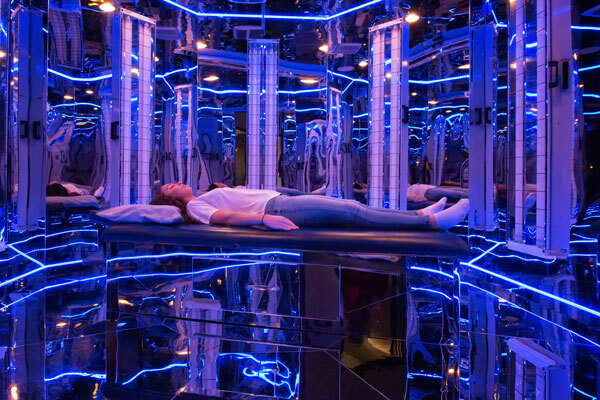 Healing and transformation of any sort will be unique to the individual not only in the sense of distinct genetic make — Blu Room sessions a week and each session is different. Let me paint a picture. The Blu Room is an 11×11 room shaped in an octagon using sacred geometry from Nicola Tesla’s work. All the walls, ceiling and floor are covered with stainless steel creating a mirrored effect of eternity. The UVB lights are attached to the walls and ceiling and there is a massage table in the center of the room. There are Blu led lights that line the room providing a soft blue colored glow. The client comfortably lays on the massage table fully clothed with eyes protected for a 20 min session. Soft music plays and the UVB lights turn on for the initial 3,6,9 min and then you relax absorbing the frequency created for the remainder of the session. Some people report taking a power nap leaving them recharged for the rest of their day and others find its the perfect opportunity to visualize and meditate on what they want to manifest in their life. You can’t “do” it wrong. When you enter the Blu Room, you are entering a place of non judgement. You will feel embraced by this frequency of pure unconditional love. When you focus on your intent without mentally feeling pulled in a hundred different directions your intent can manifest Godspeed. The Blu Room says whatever you desire… SO BE IT!!! For more information or to make an appointment, call 636-432-1731 or visit our website BluRoomWellnessCenter.com. This entry was posted on Tuesday, October 30th, 2018 at 1:16 am and is filed under December 2018, November 2018. You can follow any responses to this entry through the RSS 2.0 feed. Responses are currently closed, but you can trackback from your own site.